Many offshorers, deregulators and other proponents of business-as-usual trade policy claim that those who oppose NAFTA-style trade pacts somehow “oppose trade,” as if there’s only one way of doing things. This tired old myth is easy to disprove. 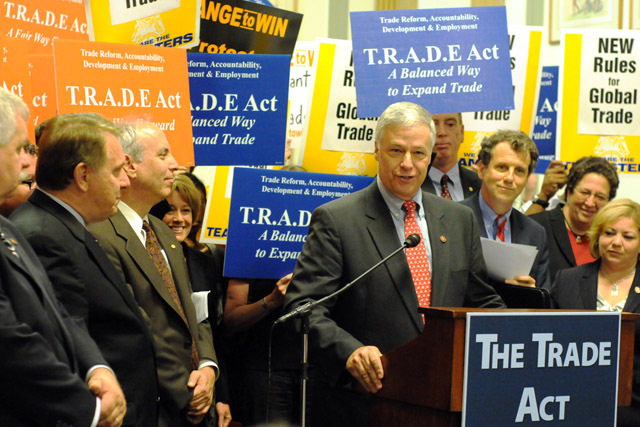 ORFTC supports a landmark piece of fair trade legislation called the TRADE Act, which had over 150 cosponsors in the last Congress, including the vast majority of House Democrats. The bill offers a way to help ensure that future trade policy actually benefits working people and strengthens the economy, as well as protecting consumers, the environment, public health and small farmers, both at home and abroad. The TRADE Act is supported nationally by a wide range of progressive organizations including the AFL-CIO, Change to Win, Sierra Club, National Farmers Union, United Methodists, Public Citizen, United Steelworkers, Machinists, AFSCME, Teamsters, Communication Workers of America, UNITE HERE, Friends of the Earth, National Family Farm Coalition, Public Citizen, Citizens Trade Campaign and many others. Please voice your support for this important legislation as it moves forward in the new Congress. TAKE ACTION: Urge Senator Wyden and the rest of Oregon’s Congressional delegation to cosponsor the TRADE Act!